In the photo, Muzu Sibanyoni (left) and Nhlanhla Dlamini (right) explore their right brains! A KZN Department of Education Special Meeting for Youth Development specialists held in Durban for all 12 districts established that they ALL would like training in right brain writing as it is being proved that educational standards improve in districts where these trainings have taken place. UThekula District already has the lead with a trained Master Mentor in Thembi Njoko. On Thursday and Friday 5 and 6 of December Mr Muzu Church Sibanyoni from Zululand District and Mr Nhlanhla Dlamini from Ukhanyakude District started their Master Mentor Training at Felicity’ Keats home office. 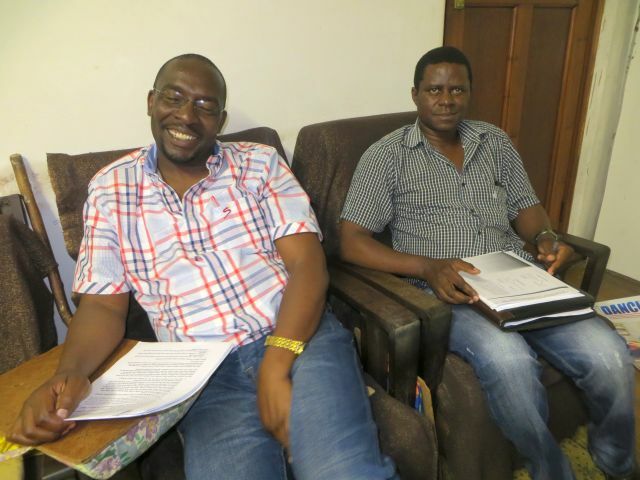 Both have had positive reports for their districts after trainings separately held last year at Magudu Lodge in Pongola for learners and teachers. The ball is in the court of the remaining districts who will venture into their right brains with Felicity who will train them all at no charge. Improved educational standards are our priority!